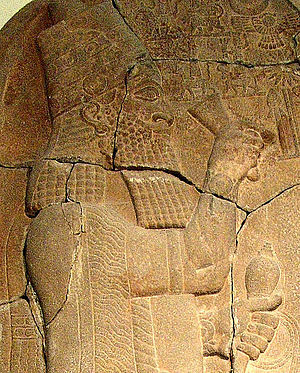 Esarhaddon (Akkadian: Aššur-aḥa-iddina "Ashur has given a brother"; Template:Hebrew Name; Ancient Greek: Ασαρχαδδων; Template:Lang-la) was a king of the Neo-Assyrian Empire who reigned 681 – 669 BC. He was the youngest son of Sennacherib and the West Semitic queen Naqi'a (Zakitu), Sennacherib's second wife. When, despite being the youngest son, Esarhaddon was named successor by his father, his elder brothers tried to discredit him. Oracles had named him as the person to free the exiles and rebuild Babylon, the destruction of which by Sennacherib was felt to have been sacrilegious. Esarhaddon remained crown prince, but was forced into exile at an unknown place beyond Hanilgalbat (Mitanni), that is, beyond the Euphrates, most likely somewhere in what is now southeastern Turkey. 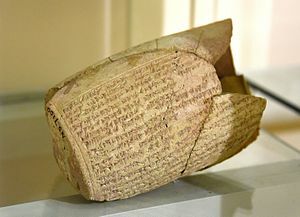 Sennacherib was murdered in 681 BC. The biblical account is that Esarhaddon's brothers killed their father after the failed attempt to capture Jerusalem (2 Kings 19:37). Esarhaddon returned to the capital of Nineveh in forced marches and defeated his rival brothers in six weeks of civil war. He was formally declared king in the spring of 681 BC. His brothers fled to the land of Ararat and their followers and families were put to death. 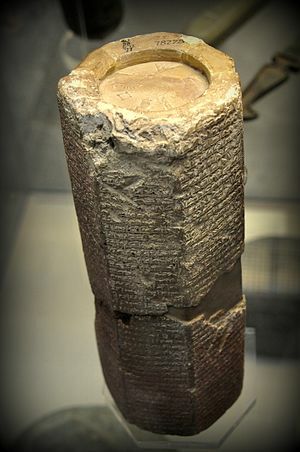 In the same year Esarhaddon began the rebuilding of Babylon, including the well-known Esagila and the Ekur at Nippur (structures sometimes identified with the Tower of Babel). 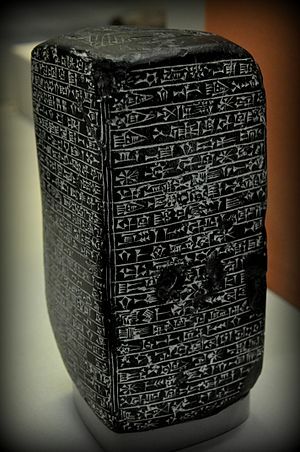 The statues of the Babylonian gods were restored and returned to the city. He also ordered the reconstruction of the Assyrian sanctuary of Esharra in Ashur as well. Foreigners were forbidden to enter the temple. Both buildings were dedicated almost on the same date, the second year of his reign. Esarhaddon had to contend with court intrigues at Nineveh that led to the execution of several nobles, and sent his general, Sha-Nabu-shu, to restore order in the Nile Valley. In 669 BC, he went to Egypt in person, but suddenly died during autumn of the same year, in Harran. 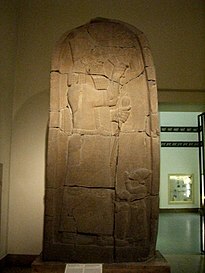 He was succeeded by Ashurbanipal as king of Assyria, and Shamash-shum-ukin as king of Babylonia. ↑ "Ezra 4 / Hebrew - English Bible / Mechon-Mamre". Mechon-mamre.org. Retrieved 2012-08-17. ↑ 2.0 2.1 "NEW ADVENT BIBLE: Ezra 4". Newadvent.org. Retrieved 2012-08-17. ↑ Barbara N. Porter (1993). Images, power, and politics: figurative aspects of Esarhaddon's Babylonian policy. American Philosophical Society. pp. 62–. ISBN 978-0-87169-208-5. Retrieved 8 June 2011.